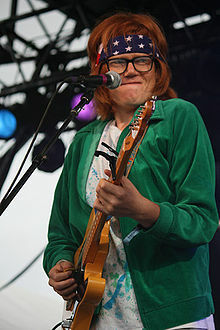 Brett Michael Dennen (born October 28, 1979) is an American folk/pop singer and songwriter from Central California. His sixth studio album, Por Favor, was released in May 2016. As a child, Dennen was homeschooled, where he was given creative free rein by his parents. He spent much of his time learning to play music. After becoming proficient in the guitar, he started to write his own songs. Dennen attended Camp Jack Hazard, a residential summer camp, as a child and adolescent, and worked there as a counselor. He has continued to help the camp, performing at a fundraiser in February 2012 for the Jack and Buena Foundation, which now runs Camp Jack Hazard. Brett's older sister and younger brother also attended the camp, and his mother has served on the board of directors of the Jack and Buena Foundation. His second album, So Much More, includes the singles "Ain't No Reason", "She's Mine" and "Darlin' Do Not Fear". Dennen also contributed a cover of "Private Life" to the 2006 tribute album Drink To Bones That Turn To Dust: A Toast To Oingo Boingo. In an interview with American Songwriter magazine, Dennen acknowledged Paul Simon's significant influence on his music as well as commenting that Paul Simon's ""Graceland is my all time favorite album." In 2008, "Darlin' Do Not Fear," from So Much More, was featured in the award-winning, independent film Sherman's Way. As The Mosaic Project's Resident Rock Star, Dennen created an original musical curriculum for the program which they released as an album called Children's Songs for Peace and a Better World in 2003. It won a Children's Music Web 2004 Award and a Parent's Choice 2004 Approved Award. Dennen was named by Rolling Stone magazine as an "Artist to Watch," and in 2008, Entertainment Weekly called him one of its eight "Guys on the Rise". He has attended[vague] festivals such as the Rothbury Music Festival in Michigan, Telluride Bluegrass Festival, Lyons Folk Festival, and the Mile High Music Festival in Colorado. In 2008, Dennen, along with Jason Mraz, contributed the song "Long Road to Forgiveness" to the Survival International charity album Songs for Survival. Earlier in the fall, Dennen toured Australia with Pete Murray. In late October, Hope for the Hopeless, Dennen's third album, was released. The song "Ain't Gonna Lose You" was featured on Grey's Anatomy and topped the iTunes folk charts. The record reached number 6 in the digital charts, and was followed by a successful mini-tour. On October 9, 2009, Dennen appeared on The Late Show with David Letterman. In 2010, Dennen played at the Oulipo Ballroom in Kentucky. He played a mixture of Paul Simon covers along with unreleased tracks from his upcoming album. His fourth album, Loverboy, was released on April 12, 2011. In 2009, Dennen's song "She's Mine" was featured on the soundtrack for the movie According to Greta; in 2010, Dennen's song "Darlin' Do Not Fear" was featured on the soundtrack for the TV show Parenthood. "Comeback Kid (That's My Dog)" is the theme song on the NBC comedy About A Boy. The song was also used in the series finale of Wizards of Waverly Place. On March 13, 2014, he appeared on episode 67 of Live From Daryl's House, performing "Only Want You", "Wild Child", "Right As Rain", "When We Were Young", "What's Gunna Happen To Us", and "Don't Mess With Karma" with Daryl Hall and his house band. ^ "California Births, 1905 – 1995". Familytreelegends.com. 1979-10-28. Retrieved 2013-05-26. ^ Harris, Lauren (2007-03-03). "The User's Guide: Brett Dennen". VH1. Archived from the original on 2008-12-02. Retrieved 2008-04-08. ^ "Brett Dennen – Free listening, concerts, stats, & pictures at". Last.fm. Retrieved 2013-09-08. ^ "Brett Dennen". Rhapsody. Retrieved 2013-09-08. ^ "Brett Dennen Biography". Starpulse.com. 1969-10-28. Retrieved 2013-09-08. ^ "Dennen, Brett". Encyclopedia of Popular Music. Oxford Music Online. Retrieved 8 April 2014. ^ Brown, Patrick. "Bay Area nonprofit fights to keep camp alive". Bay Area News Group. Retrieved 11 September 2012. ^ Evan Schlansky (June 4, 2012). "Watch Brett Dennen Perform "Crazy Love, Vol. II" Off Paul Simon's Graceland". American Songwriter. Archived from the original on 2012-06-05. Retrieved 5 June 2012. ^ "Announcing The Children's Music Web Awards 2004 Winners". Childrensmusic.org. Archived from the original on 2013-05-19. Retrieved 2013-05-26. ^ Greenblatt, Leah (May 21, 2008). "Guys on the Rise: 8 Emerging Singer-Songwriters". Entertainment Weekly. ^ "Brett Dennen: Newport Folk Festival 2009". Npr.org. Retrieved 2013-09-08. ^ "Episode 67: Brett Dennen :: Live From Daryl's House with Daryl Hall :: Current Episode". Livefromdarylshouse.com. Retrieved 2016-06-28. ^ a b c d e f g h i "Brett Dennen Chart History: Triple A". Billboard. Retrieved 2018-10-09. ^ "First Listen: 'Gazing With Tranquility – A Tribute To Donovan'". NPR. Archived from the original on October 15, 2015. This page is based on the Wikipedia article Brett Dennen; it is used under the Creative Commons Attribution-ShareAlike 3.0 Unported License (CC-BY-SA). You may redistribute it, verbatim or modified, providing that you comply with the terms of the CC-BY-SA.